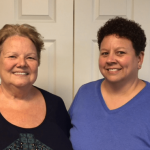 Patient Testimonials - Advanced Rehabilitation, Inc. I came to ARI because I had been in pain for over 5 years. I had headaches, back pain, wrist pain, and swelling. I had trouble doing anything. It was hard to clean my house after work. I had several headaches a week and have been on pain medication for years. ARI really helped me to take control of myself. They have shown me exercises and other things to do to help myself. Because of the work they do and the help they have given me, I am now having pain free days for the first time in over 5 years. I haven’t had a headache in over 3 months and I am able to do house work and more after a full day of work. They have shown me understanding and kindness. I now know how to prevent my stiffness and pain. I have cut back on my medication by half and I am more active than I have been in years and can do more with my kids. I came to ARI with problems in my left shoulder. The doctor said it wasn’t a torn rotator and that I needed physical therapy. I can now sleep at night, my shoulder is more mobile, and I have a lot less pain. The staff has been wonderful. 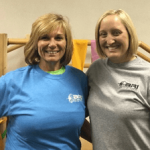 Tina and Brandi were my therapists and they made me work at my exercises. The work has been hard but results are great. I consider myself a very healthy person until a recent trip to Mexico. No, I did not get Montezuma’s curse. Yea! I returned with vertigo. Boo! Every time I turned my head everything would go 360 °. I toughed it out 3 ½ weeks and then googled it. After reading about the Epley Maneuver curing 80% of BPPV after one treatment, I picked up the phone and called ARI. Imagine my surprise after one treatment that I was able to turn my head immediately without the room spinning. I was even able to go to Pilates class that evening. If my next trip precipitates BPPV again, I’m not waiting to call ARI immediately! I came into ARI because my hamstring was bothering me. They performed dry needling on me which soon began to take away the pain. I can now get back to playing sports at my 100% potential. Thank you to all the ARI staff who helped me heal. I was referred to ARI by my family physician for headaches. Upon my first visit it was determined that I had a lot of muscle tension and tightness in my neck. I started working with Andrea which was awesome. She helped me work on exercises to work out all the tightness in my neck, shoulder, and upper back. Before coming to ARI, I never knew these muscles could be associated with headaches. I can now do exercises at home and live headache free. I will definitely be back if I ever need physical therapy again and I recommend ARI to anyone who needs physical therapy. I came to ARI because I was having severe pain in my left knee. I could tell my leg along the outside of my knee did not feel right. Amanda did ASTYM treatments and stretching exercises to my IT band which was really tight and knotted up. She also gave me strengthening exercises to do to make my muscles stronger in my back and hip which affect the muscles down to my knee. All the staff is very helpful in guiding you to do exercises and stretches properly. I have having no more pain and can sleep all night!!! Yay!! I came in after a spinal fusion. I wasn’t able to lift with my left arm and I couldn’t turn my head without extreme difficulty. I was very discouraged. After a few days with Becky, Meghan, and Ashley they had me turning my head and lifting light weights. These ladies are amazing and so good at what they do. I will brag to everyone I know about ARI and the wonderful staff. I can’t thank you all enough! I was losing my balance pretty often. Now I can walk better, a lot better! I couldn’t raise my toes on my right foot and now I can raise them. Very good. 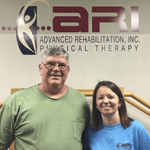 I had a knee replacement in April of 2017 and started my physical therapy at ARI directly after my surgery. My first few visits were difficult as I had very little range of motion, but I was determined to make this knee replacement work for me. Prior to my knee problems, I became very active and was training for an Ironman race. Two weeks before my Ironman race, my knee started giving out on me and I could no longer run, but I could walk. I completed the Ironman race in October of 2016, but soon after that my knee got worse. I could no longer walk without a limp, I could hardly bend my knee and I was in constant pain due to osteoarthritis, torn meniscus, and bone spurs. So, after surgery and when my PT started, I was determined that I was going to get back to being active again. I went to PT as schedule and worked hard (even grunting and screaming) to get my ROM where it needed to be. When at home, I did my PT exercises 3x a day; in the morning, early afternoon, and then again in the evening. In a matter of 8 weeks, I was able to start leading spin classes again at the local gym; a couple of weeks later, I was out on the road bike doing what I love…cycling! 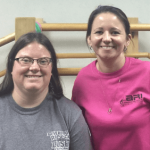 Thanks to the Physical Therapists that worked with me and pushed me at ARI, and my own discipline, I was able to graduate from ARI, return to work, and I am beginning to get back to my active lifestyle. Thanks to the ARI staff and a special thank you to Marie, the intern whom I worked with most days. She will have a bright future ahead of her. I started going to ARI late last summer after I had a medial tear of the meniscal root. I had hoped to avoid surgery, but I soon realized that I wasn’t able to have the active lifestyle I had prior to my injury. 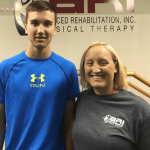 Brandi worked with me pre-surgery to help me strengthen my quad and hamstring so that my recovery would be a little easier. I had surgery in early January and began post-surgery PT immediately after. I was totally non-weight bearing for 6 weeks then gradually worked my way back to being fully weight bearing. 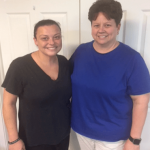 Brandi did a great job of helping me not only regain my strength to a functional level but also to get my range of motion to a functional level. 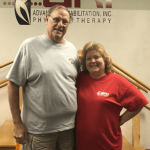 I reached my therapy goals very quickly; less than 6 weeks after I started walking again, I was released from physical therapy. Brandi did a great job of getting me back to my active lifestyle. 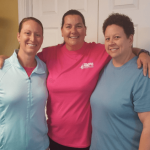 I am back to leading group fitness classes at Everbody’s and doing all the things I love to do. When I saw my surgeon for my 12 week post-op appointment, she was amazed at what I was able to do. At that point I was already spinning for 60 minutes; Dr. Lee said that all of her patients who had had this surgery were, at that point, still struggling to go up and down stairs. Brandi was also a great sounding board when I would get frustrated, when I felt like I wasn’t progressing fast enough. 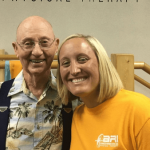 She reminded me that physical therapy isn’t the best time to be an over-achiever. She pushed me to do the most I could do without letting me more than I should do. I’m thrilled with the outcome of my surgery. It didn’t come without a lot of work and pain, but having Brandi by my side every step of the way made it so much better. My husband refers to Brandi as “the devil.” I prefer to refer to her as my PT angel. I was in a car accident in September 2016. A year later I was having difficulty with my neck. It was hard to turn my neck to see traffic when driving. I felt like the muscles were frozen. Now my neck is improved and I find that household tasks like carrying out the trash, doing laundry, and looking up in the top shelves of my cabinets are much better. Physical therapy has helped me recover from a dislocated shoulder, two knee operations, and whiplash from a car accident. 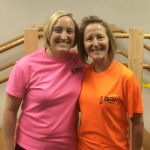 The staff at ARI are exceptional and it’s great to know they are here to help when I have an injury. I give ARI five stars! 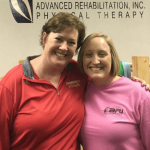 I worked with several of the physical therapists at Advanced Rehabilitation Physical Therapy and all were very knowledgeable, friendly, and genuinely interested in doing whatever was needed to aid in my recovery. 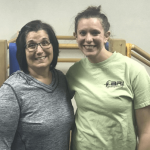 I was very pleased with all staff and would certainly recommend them to anyone in need of physical therapy in the future. Office hours that should fit a large number of people’s schedules, including weekend hours. A great place.